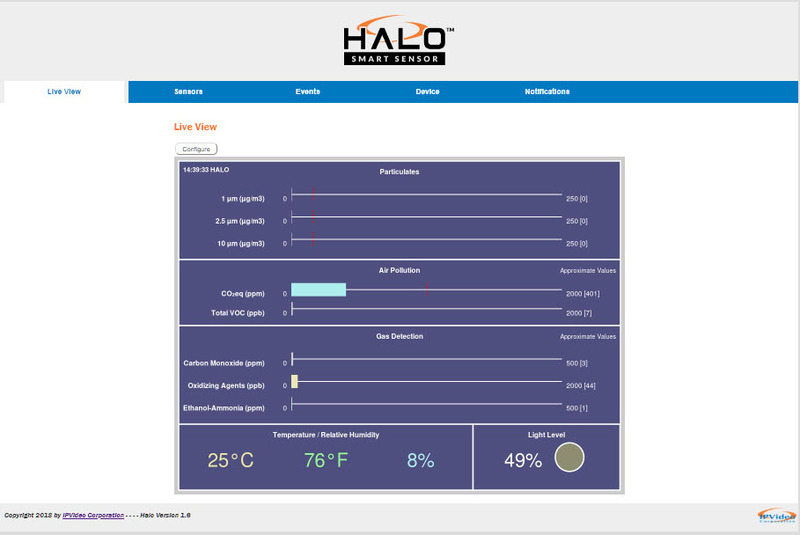 The HALO Quick Start Guide explains how to make initial connections and settings for new HALO IoT Smart Sensor devices. The following are prerequisites. One or more HALO devices connected to a standard office network where the steps in the HALO Installation Procedure have been followed resulting in confirmation that the device is operating and physically connected to the network. The network must be (at least temporarily) provided with a DHCP Server to provide initial IP Addresses. If static addressing is planned, then the correct subnet mask, gateway address, and DNS address must be known. An accessible Windows 10 PC (temporarily) connected to the same network must be available. This PC must have the Chrome browser installed and must have the HALO Setup Tool.exe copied to its desktop. The HALO Setup Tool does not require any installation. Start the HALO Setup Tool on the PC by double clicking the program icon. The program scans the network looking for HALO Devices. After a few seconds, the MAC address of each HALO device should be displayed in the list at the left. There should be an address for each HALO device on the network. 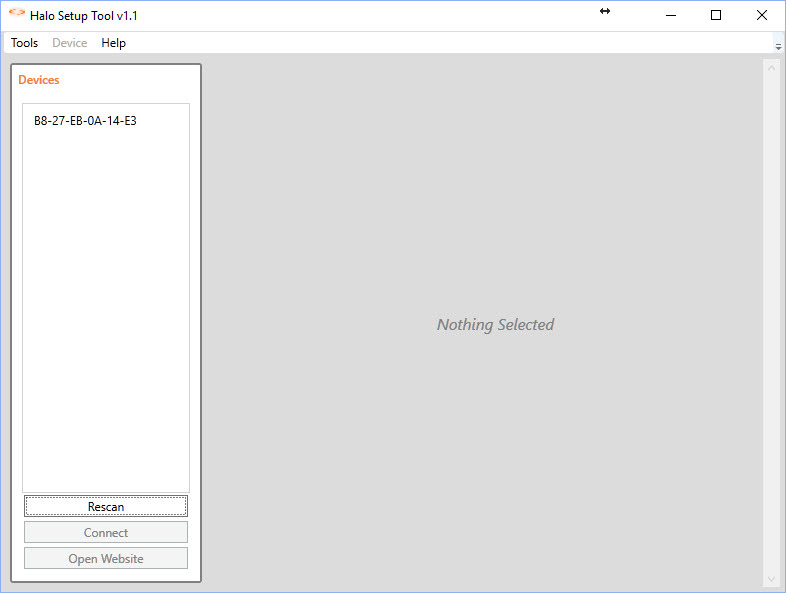 The HALO Setup Tool does not scan beyond the local network subnet (such as 192.168.1.X for example). Devices on other subnets, even though physically connected, will not be seen. The default Username is “admin” and the default password is the displayed MAC address entered with all upper case letters and no dashes, for example, B827EB0A14E3. Note that 0 is always numeric zero. Click OK to connect to the HALO device. Make note of this password as it is needed again later. If the Mode is Automatic, this is likely a new Device. The Device may be left in DHCP (Automatic) Mode if the system administrator allows DHCP operation. If the Mode is Static, this Device has likely been previously setup with a Static IP address which will be displayed here. This is the end of the usage of the HALO Setup Tool. Open the Chrome browser on the PC and type the HALO Device’s DHCP or Static IP address into the browser’s address bar. The Sign In dialog should be displayed as shown on the left. 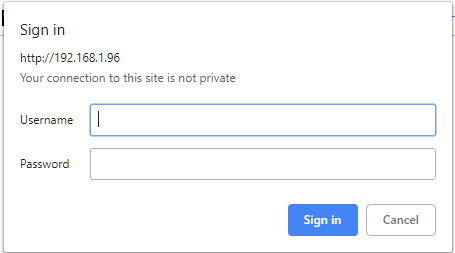 Type the Username and Password from the previous steps into the Sign In dialog and click Sign In.The Live View tab should be displayed by default as shown to the right. Make note of the firmware version displayed at the bottom of the page. The Live View tab should be displayed by default as shown to the right. Make note of the firmware version displayed at the bottom of the page. The Live View tab shows the current values detected by all the HALO Sensors and is a good place to check for overall functionality. If the facility network requires the use of Static IP Addresses, obtain the IP address, Sub-net Mask, Gateway, and DNS to be used for this specific Device, and follow these steps. Enter the desired IP Address in the format shown. Enter the Netmask (Sub-net Mask) in the format shown. Enter the Router (Gateway) IP Address in the format shown. Enter the DNS Server IP Address or Domain in the format shown. Click Save to commit these settings. Make note of all these values together with the MAC address of this HALO Device. This HALO Device is now set to a Static IP Address. This completes the Quick Start procedure for a new HALO IoT Smart Sensor Device. *Note to integrators/resellers – we understand it is common practice to change passwords for cybersecurity measures. Please keep in mind that the latest device passwords will be needed for troubleshooting if you request support from IPVideo.